"If you want to set off and go develop some grand new thing, you don't need millions of dollars of capitalization. You need enough pizza and Diet Coke to stick in your refrigerator, a cheap PC to work on and the dedication to go through with it." Software and cathedrals are much the same - first we build them, then we pray. Seth Godin’s blog is one of those that I religiously follow. He is a great marketing guru, wrote numerous books and speaks at various conferences. He always finds the right way of saying things and he’s simply a great writer. If you haven’t already done so, add his feed to your feed reader. You won’t be disapointed. For example, here is Seth’s post for today. Very insightful. The telephone destroyed the telegraph. Here's why people liked the telegraph: It was universal, inexpensive, asynchronous and it left a paper trail. The telephone offered not one of these four attributes. It was far from universal, and if someone didn't have a phone, you couldn't call them. It was expensive, even before someone called you. It was synchronous--if you weren't home, no call got made. And of course, there was no paper trail. If the telephone guys had set out to make something that did what the telegraph does, but better, they probably would have failed. Instead, they solved a different problem, in such an overwhelmingly useful way that they eliminated the feature set of the competition. The list of examples is long (YouTube vs. television, web vs. newspapers, Nike vs. sneakers). Your turn. On the Financial Times’s blogs Tony Barber wrote this article about his recent experience of machine translation. After hearing a recommendation that bloggers should “try to use computer-generated translations” to provide foreign language versions of their own blogs he decided to see for himself and he put Google Translate to the test. Within a few moments of President Obama being sworn in, a new whitehouse.gov was revealed. The new site looks great, and promises greater transparency about the actions the american government. Compare this to the robot.txt from Bush's era… I’ll let you draw your own conclusions. Want to call a meeting today? Then first, stop and consider the hourly cost of the people that will be attending your meeting. You'll realize quickly that calling a meeting is very expensive since no productive work is done during that time. It's important to ensure that every person present and every minute of your meeting adds value. It’s equally important that your motivation for calling this meeting is justified and need a consensus of everyone attending. Don't invite people who won't participate but will simply report back to their boss or team (sending a copy of the meeting minutes by email will be a lot more effective). Also, don't call a meeting to tell people things that could be communicated by email or memo. In fact, you should only call a meeting when actual decisions needs to be taken or something really needs to be discussed live with the attendees. You are prepared. People don’t like seeing the main speaker confused or ill-prepared. You assign someone to the note-taking task. Everyone else can then actively participate, knowing that the full meeting notes will be emailed to them later that day. You verify that everyone present has a good reason to be present. You keep it short and sweet. A long, boring meeting is useless and energy-draining. The most effective meetings I've seen are the daily stand-up meetings in the Agile Methodology. They typically last from 5 to 15 minutes and still manage to get a lot done in that period of time. The Convert function in SQL Server provides a means to translate SQL Server’s default date format to just about any format. However, the convertion format isn’t intuitive at all. I wanted to have a quick reference for the future and help those who had trouble finding a list of all the possible convert options in T-SQL. I’m back from my little vacation and I just found a great post on managing teams of developers, programmers and others geek-type employees. I think the author is right on point and I agree with him on everything. Try to measure productivity in output, not in hours. Geeks automate. Geeks script. 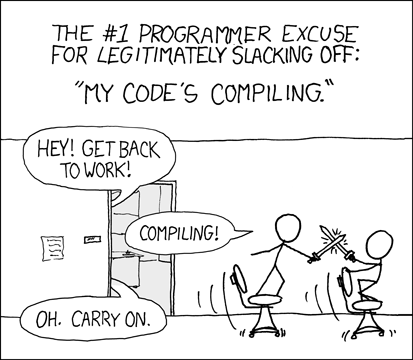 Geeks compile. They summon computing power to get things done quickly on their behalf. If your geek seemingly spends all day on Twitter and Fark but somehow manages to still complete tasks ahead of schedule, your geek is multi-tasking. This is normal. Assign tasks to the geeks who are most interested in them, not the ones with the most experience. When geeks are interested, they are passionate. When they're passionate, they learn fast. You'll get more productivity out of an interested geek with no prior experience than you will with a bored drone who's been doing the same thing for the past five years. Sometimes, the one with the most experience is the one that's most interested. In those cases, you are a lucky manager! Segregate the corporate, compensatory hierarchy from the leadership hierarchy. With a team of geeks under you, one or more will eventually become to go-to guy (or girl) for certain things. You don't usually need to assign a "team lead" - Through meritocracy, the Alpha Geek will emerge. That Alpha Geek may lack seniority, but will have the most influence. It's best to let this occur naturally. It's awkward when the one who best fits the role has to answer to someone else just because they've been around longer. Furthermore, the members of your team will still go to the Alpha Geek because the wrong person has the "Team Lead" label. As Paul Glen puts it: Geeks don't hate hierarchy. They hate your hierarchy. You'll know you've found the Alpha Geek when you see people from your team (and likely other teams) at said geek's desk getting advice or validation on a frequent basis. Don't grill us on our resume and work history. You don't hire a geek for what he or she did two years ago. You hire them for what they will be able to do for you now and in the future. Ask your geek to describe scenarios where problems arose that required them to pick up a new skill set to solve. All geeks worth their salt have stories like that and love telling them. Instead of asking about skills that qualify them for the position, ask about their interest in the kind of work they think they'll be doing. Remember: Interested geeks work harder. The above requirement will still let you H.R. types ask that oh-so-predictable question: "What is it that you think this company does?" while offering your candidate a chance to really show he or she will be a good match.